Toward a More Inclusive Quebec Society is an intersectoral research initiative in habilitation-rehabilitation and support for social integration. 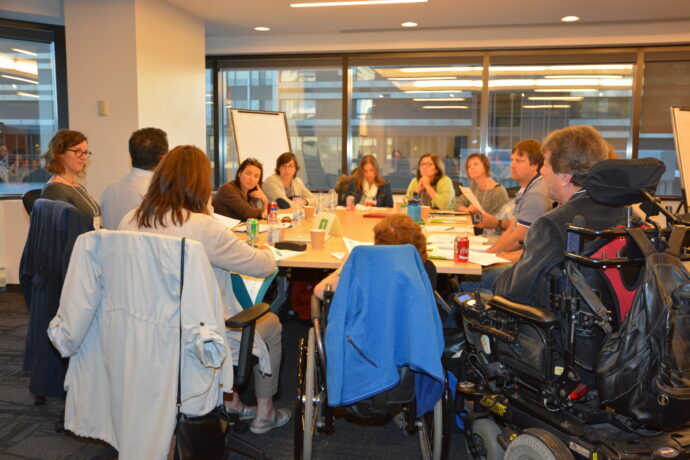 The goal is to create more inclusive physical and social environments for people with disabilities. This initiative grew out of a desire shared by the four organizations – REPAR, CRIR, CIRRIS and the INTER strategic cluster, to combine their expertise in order to address some major societal problems. It includes stakeholders in the fields of habilitation, rehabilitation and social participation as well as other related fields, in addition to partners active in community, municipal, industrial and health settings. Projects realized under this program will be intersectoral, meaning that they should involve at least two of Quebec’s three main research sectors (Nature and Technologies, Health, Society and Culture). The Inclusive Society initiative has received funding from the three Fonds de recherche du Québec in an amount of $300,000 per year for three years (2017-2020).